Receive a reward for freeing some slaves. 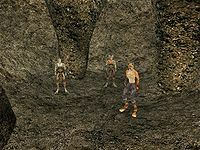 You've probably come across some of the many slaves in the game and the reference to the Twin Lamps, an abolitionist organization which helps slaves escape. The organization features a minor role in the game and you find it cropping up in various places, like Jobasha's Rare Bookshop in the Foreign Quarter's Lower Waistworks. Once you have freed 5 slaves, and spoken to one afterwards, the Twin Lamps topic will appear on various people. After you have freed 30 slaves, pay a visit to Jobasha to receive three Skill Books (Armorer, Acrobatics, and Marksman), provided his disposition is at least 70. 10 Jobasha told me that the Khajiti slaves in the Ascadian Isles and Caldera suffer. 100 Finishes quest Jobasha gave me some books for helping free the slaves. This page was last modified on 10 July 2018, at 11:40.